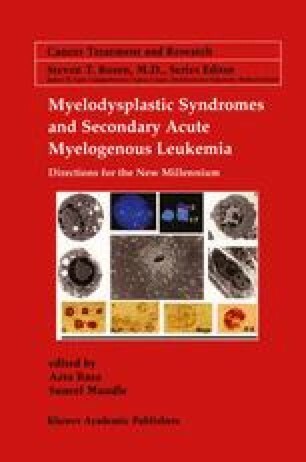 The involvement of the monocytic component in myelodysplastic syndromes (MDS) was confined for a long time mainly to the identification of a single disease, the Chronic Myelo-Monocytic Leukemia (CMML). However, more recently, the monocytes have been re-evaluated in other MDS as possible target cells directly participating into the clonal process. In MDS other than CMML, monocytes reflect the abnormality of the progenitor cells even though their contribution to the pathological aspects of the disease is sometimes not clearly expressed. Immunophenotypic and molecular studies have demonstrated that, in MDS, the malignant transformation occurs mainly at the level of the myeloid stem cells. In particular fluorescent in situ hybridization (FISH) analysis of progenitor cells sorted by FACS has shown that, in MDS patients with trisomy 8, only the stem cells at the CFU-GEMM level (CD34+/CD33+ cells) presented the +8 chromosome abnormality while the pluripotent stem cells (CD34+/Thyl+), the lymphoid B (CD34+/CD19+) and T (CD34+/CD7+) cells did not show the trisomy 8 (Saitoh et al., 1998). However, more recently, it has been demonstrated that, in 5q- MDS, the deletion occurrred in hemopoietic cells endowed with lympho-myeloid potential even though these CD34+CD38- cells were inefficient at reconstituting hemopoiesis in a NOD/SCID mouse model ([Nilsson et al., 2000]). Whatever the case, monocytes which directly derive from the CFUGEMM progenitor cells, are part of the malignant clone.